Henry was my great grandfather who emigrated to this country with his wife many years ago. Together they learned English, lived through the Great Depression and found a way to raise 10 healthy, happy children. Although I never met him face to face, I have always felt connected to him ever since the day I saw his picture on my grandmother’s bedroom dresser. She told me he was a wonderful father who loved music and adored his kids. He had a zeal for life that never faded, even when he and his family were going through the toughest of times. During the month of October I construct an ancestor altar in the style of Day of the Dead. It has pictures of departed loved ones, with Henry front and center. It also includes fresh flowers, candles and calaveras (skeleton figurines engaged in everyday activities). Every time my family sits down for supper, we light the candles and dine with our ancestors. At other times I meditate in front of the altar, burn a little mugwort (which attracts the spirits) and ask Henry to give me the wisdom and strength I need to face the challenges of the coming year. I know some people might think that’s strange, but I find it comforting and uplifting. Ancestor veneration is practiced throughout the world in some form in every culture. Unfortunately, it has mostly fallen out of favor in the United States. Yet if there was ever a time for us to revive this spiritual practice, it is most certainly now. Our world is a mess with violence surrounding us one every side. Our environment is also in peril and we need all the advice and strength we can get from our ancestors to help us navigate these perilous times. As we approach the celebration of Samhain, All Hallow’s Eve, All Saint’s Day, or Dia de los Muertos (depending upon your spiritual path), many of us believe the veil between us and those on the other side is thinnest. It is the perfect time to commune with our beloved dead and draw strength from them. If you’ve never constructed an ancestor altar before, start small. Use the top of a dresser or a shelf in a book case. Include pictures of those you wish to remember, along with small mementos, a candle, and maybe some fresh flowers or incense. Use this altar as a place to meditate and pray in the coming weeks and see what wisdom the beloved dead have to offer you! If you’re like me you will discover that you won’t want to dismantle this altar after the month of October comes to an end. Personally, I reluctantly take the big altar down but I also construct a smaller one in my office where it remains for the rest of the year. It is a visual reminder that our ancestors and Ancient Ones are always with us, building us up and cheering us on every step of the way! 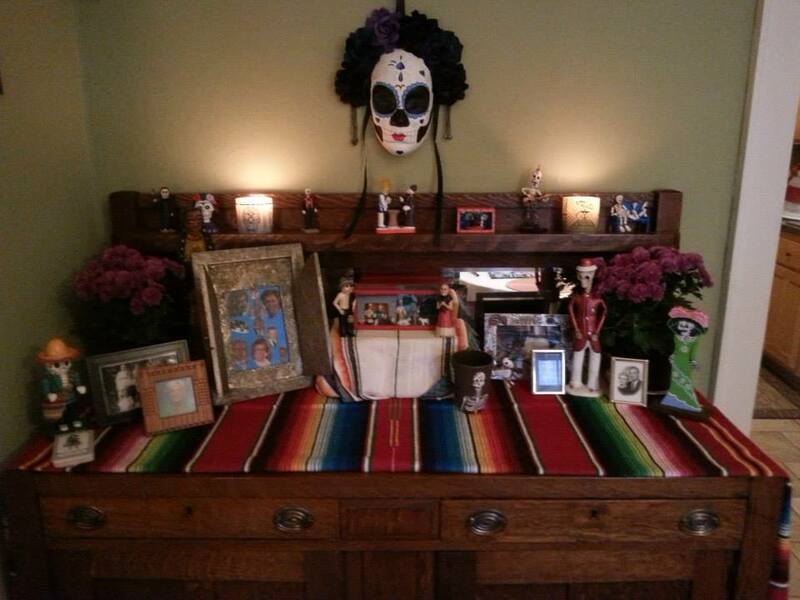 This entry was posted in Samhain and tagged All Saint's Day, Ancestor Altar, Day of the Dead, Samhain. Bookmark the permalink. This is what Samhain/All Hallows is really all about. Thanks! It is my favorite time of the year. In doing my family history, I always make a note in my diary whenever I learn of the death of any ancestor that I have discovered. Then every year I light a candle on that particular date, maintaining a connection throughout the course of my life. Beautifully said. Every choice our ancestors made, every sacrifice they gave, made us what we are today. Any way you look at it, we owe them. Thank you.